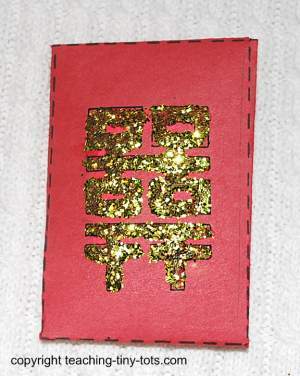 Make a red money envelope and give to someone special as a blessing of good wishes for the coming year. Nickel, Quarter, Play Money or write a New Year's Wish on a small piece of paper. Print out lisee envelope on red construction paper. Put glue on the pattern and sprinkle with glitter. Dust off excess and let dry. Cut out the envelope pattern. If you do not have construction paper, print on white paper and use crayons to color background red and the pattern black. Write a message on a small piece of paper, fold and place in envelope. It is also common for adults or young couples to give red packets to children. Red packets almost always contain money, usually varying from a couple of dollars to several hundred. Per custom, the amount of money in the red packets should be of even numbers. Sometimes chocolate coins are found in the red packets.